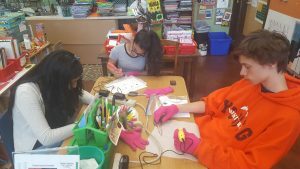 Leonardo’s Workshop: Our Makerspace in the Art Room! Leonardo’s Workshop started the fall of 2016. 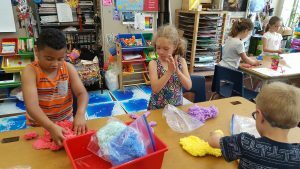 Over the years, our school has been a leader in the arts integration and prairie reclamation movements in the Chicago area. Last spring, our administration and Instructional Leadership Team (ILT) added STEAM (Science, Technology, Engineering, Arts and Mathematics) to our Continuous Improvement Work Plan (CIWP) to enhance our educational goals for the upcoming school year. With the support of our administration, Waters Today (our community fundraising group) and grant monies from Education Closet we have been able to establish our school’s first Makerspace in our art room. Leonardo’s Workshop is our art room’s Makerspace that supports STEAM initiatives and celebrates student ownership of learning. Leonardo’s Workshop or the Maker Movement is not just about a cool space or a bunch of fancy stuff. It’s a mindset—trusting children’s desire to imagine and create. As teachers and students, we need a bit of structure and that’s where design thinking makes a difference. LAUNCHing takes it out of the hands of the teacher. The authentic audience is the jury and judge. Let go and enjoy it! Leonardo’s Workshop’s mission is to create intellectual and physical space for students to direct their own creativity and to pursue their own interests. 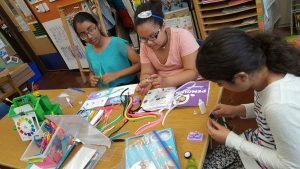 Leonardo’s Workshop Maker Camp is an intensive after school laboratory that uses design thinking in a variety of cross-disciplinary challenges to experiment, experience, explore and express. What is Leonardo’s Workshop Maker Camp? 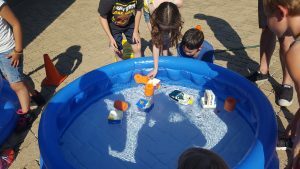 In our first year, over 45 3-5 grade students experienced 10 week Maker Camp experiences—creating drawing robots, Maker circuit villages, conductive gloves, marble runs and motor boats. In our second year we had over 75 students participating in both TYROS (beginner) and VETS (2nd year) sessions. We even had a Super VETS club of 10 students who have participated in every Leonardo’s Workshop offered—BRAVO! (We’re thinking about ULTRA Vets this year!) At the end of last school year, we conducted a 3 week Maker Mini-Camp with the support of Columbia College’s Scientists for Tomorrow Advanced Robotics curriculum and Liam S., a high school student facilitator. Students created a robot that could move using an Arduino board and Ardublocks coding language. (I’m not there YET—I just watched Liam and the kids go at it:)!) Many thanks to Ismaias—our 2016-2017 Leonardo’s Workshop mentor and Max, our 2017-2018 mentor! 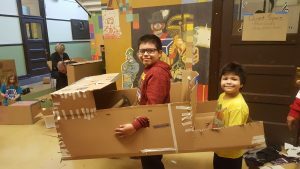 October 2016: Our first all-school/all family cardboard challenge was a huge success.We patterned our day on the experience of Caine’s Arcade. Check out our inspiration http://cainesarcade.com/and our amazing designs! 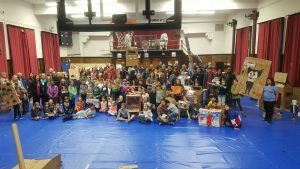 April 2017: Our second all-school/all family cardboard challenge focused on A.J Juliani and Jon Spencer’s global design challenge initiative. We asked students to demonstrate locomotion in their cardboard designs. This was a tremendous family event that showed the evolution of design ideas in just a few months. We are excited to see our next cardboard challenge! We LAUNCHED (http://thelaunchcycle.com/) our Leonardo’s Workshop Maker Camp experience at Chicago’s only Maker Faire! We enjoyed sharing our learning with K-12 students throughout the Northside area. We showcased our marble runs, drawing robots and Maker villages. 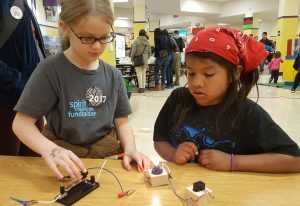 We also taught a variety of peers how circuits create energy—light, motion and sound by demonstrating our circuit constructions. 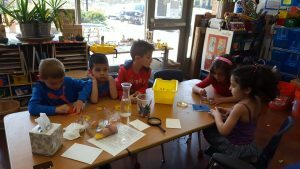 Recently, Leonardo’s Workshop was featured in Education Closet’s spring online conference. It was great fun sharing our Makerspace experience with numerous educators from around the country. We also shared our Global Cardboard Challenge Gallery Walk designs. 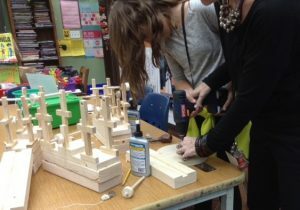 If you would like to learn more about the educational theory and implementation of Makerspaces, Design Thinking, STEAM Initiatives and Choice-based Studios in the Art Room—Education Closet https://educationcloset.com/has fabulous resources.